Estimated insurance prices for a Chevrolet Malibu are $1,366 every 12 months with full coverage. Comprehensive insurance costs around $306 each year, collision insurance costs $512, and liability costs around $390. A liability-only policy costs as low as $452 a year, and high-risk insurance costs $2,940 or more. Teens pay the most at up to $5,052 a year. Includes $500 policy deductibles, liability limits of 30/60, and includes additional medical/uninsured motorist coverage. Rates include averaging for all U.S. states and Malibu models. For the average driver, insurance rates for a Chevrolet Malibu range from the cheapest price of $452 for just the minimum liability insurance to a high rate of $2,940 for a driver that may need high-risk insurance. Where you live can make a big difference on insurance rates. Areas with sparse population are statistically proven to have more infrequent collision claims than cities with more traffic congestion. The graphic below illustrates how location impacts auto insurance rates. These rate differences demonstrate why all drivers should compare prices for a specific zip code and their own driving history, instead of making a decision based on averaged prices. 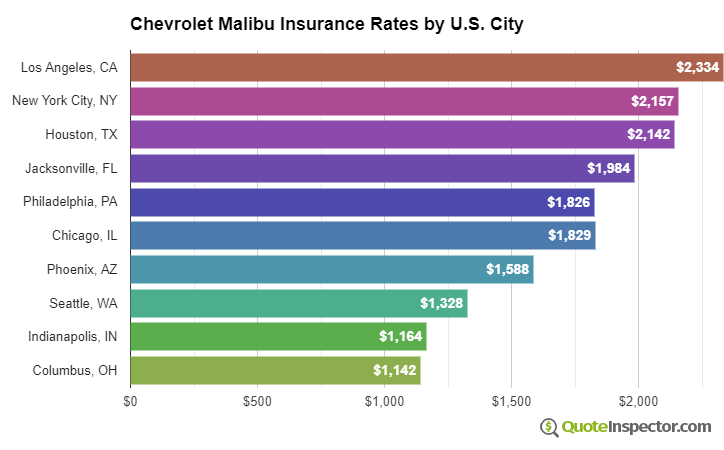 The chart below details average Chevrolet Malibu insurance rates for additional coverage choices and driver risks. Auto insurance prices for a Chevrolet Malibu also have a wide range based on physical damage deductibles and liability limits, your driving record, and the trim level and model year. Where you choose to live has a huge impact on Chevrolet Malibu insurance prices. A driver around age 40 might see prices as low as $980 a year in states like New Hampshire, Ohio, and Utah, or have to pay at least $1,850 on average in Florida, Michigan, and New York. Rates are averaged for all Chevrolet Malibu models and trim levels. Rates assume a 40-year-old male driver, full coverage with $500 deductibles, and a clean driving record. 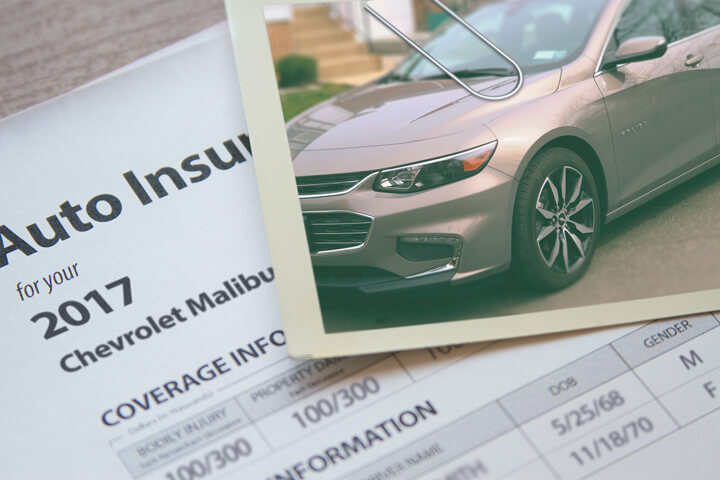 Finding better rates on insurance for a Chevrolet Malibu requires being a good driver, having a good credit score, being claim-free, and possibly raising deductibles. Spend time shopping around once a year by getting quotes from direct companies, and also from several local insurance agents. The following list is a recap of the data that was touched on above.